In early times barbers were known as tonsorial artists. They knew that when a man got married he carried a middle part in his hair, when a man was a master he has a left part in his head, and when you are a widower there is a right part in your head. They were also multitasked individuals. The barber pole of red, white, and blue was used to let people know that the individual could not only cut hair and shave beards, but also could perform tooth extraction, bloodletting and even some surgery. The traditional barber’s pole represented ‘Blood and Bandages’. Even in the late 1800s and early 1900s barbers were known to extract the odd tooth. Over time the pole became the symbol for barbershops and haircuts. The first known tonsorial artist to set up shop in Leduc was Sam Gregory when he partnered with Jerry Boyce to set up his barbershop in the Waldorf Hotel. Prior to this most haircuts were done at home, if at all. His barbershop was a place to get a haircut and a shave as well as hear about the latest news. Sam was a colorful character and drew customers with his skill and his wit. Customers came and returned because Sam’s shop had become a place to exchange ideas and opinions. If you didn’t have an opinion Sam was only too glad to provide you with one. The Waldorf Hotel would continue to host a barbershop through the years and when it was rebuilt in 1949 they added a beauty salon. In 1908 Albert Bonin established his barbershop and for the next 48 years cutting hair where, for a time, one could read a sign stating, “A shave and haircut for two bits” (25 cents). As Leduc continued to grow the need for additional barbers increased and in 1936 Arnold Klatt started his career as a barber in Leduc. After the fire that destroyed the Waldorf Hotel he established his barbershop on Main Street. Later he would add William (Bill) George Lebid as a partner in 1947. Lebid was born in 1920 at Shepenge, Alberta a small community located just north of Two Hills. He served in World War II and when he left the military in 1945 he had acquired the skill of a barber. Bill’s partnership with Klatt lasted for 23 years until 1970 and then the OK Barbershop would continue under Bill’s sole ownership until December of 1996 when he decided to retire after fifty years. Even after retirement Bill would continue to cut hair for his friends in his basement until 2007. Harry L. Nazarenko was born in the Cypress Hills and grew up in Maple Creek Saskatchewan. He arrived in Leduc in 1947 and soon set up his barbershop in the Waldorf Hotel. Shortly after Harry met the love of his life Mary. The two of them combined their skills and opened H & M Hairstyling and refurbished an old café to accommodate Harry’s barbershop and Mary’s hair salon. After thirty years Mary retired and in September of 2006 Harry retired after 62 years as a barber, selling his shop to Talal (Tom) Najmeddine. Tom moved his family to Leduc from Edmonton and changed the shop’s name to The Goodfellas Barbershop and began operation in early 2007. Today Leduc has a number of places where one can go to get their hair styled and cut. 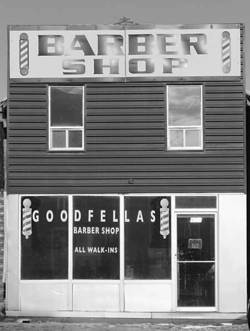 However, The Goodfellas Barbershop remains the only shop on Main Street providing an opportunity to step into Leduc’s past and carries on the traditions first established by Sam Gregory in 1896. Goodfellas is the place where one can sit and relax, exchange the news of the day, and get a very decent haircut for a reasonable price.